Katja Petrowskaja has indeed, as her publicist claims, written an “inventive and unique literary debut” as she travels to various countries in search of her family’s dramatic 20th century history. Her search reveals her Jewish roots and ancestral legacy, written in reflective vignettes. The book is intelligent, introspective, uniquely crafted, and erudite. Those qualities make the book notable, but they can also make the characters and the work itself seem oddly distant at times, especially when it focuses heavily on the author’s interiority rather than the characters. Some direct quotes or even imagined dialogue from the people she is striving to discover could have brought events and characters closer. For example, Petrowskaja says of her grandmother Rosa that she wrote her memoirs “incessantly and in great haste, in pencil on white paper.” Were there no bits of those memoir writings to share so that Rosa’s voice can speak for itself? Did none of the other people she writes about—the great uncle who shot a German diplomat in 1932, her grandfather who went underground during the Bolshevik Revolution in Russia, her great grandmother whose gives the book its title—leave a record in their own words that might draw us closer to them? This limitation is overcome to a large degree as the familial stories progress and illuminate the history of troubling times in Russia, Ukraine, Poland and Germany, although keeping track of all the characters and historical events can be challenging. There is no denying, however, that the characters are fascinating, like the history about which Petrowskaja writes. Rosa fled Kiev with her two daughters because of the war in 1941. One of those daughters was the author’s mother. She described to Petrowskaja being in an overcrowded train; Petrowskaja describes it for us. The chapter on Poland is enlightening and moving. When Petrowskaja visits Warsaw, a city where several relatives had lived, she realizes that the ghosts of anti-Semitism are still present. “As a tourist entering the city,” she says, “you have to decide which catastrophe you are basing your visit on, Warsaw uprising or ghetto, as though there had been two Warsaws . . .” The old town displays plaques remember the uprising”—reminders that “before the war, Warsaw was full of the Jewish faith, Jewish cooking, and the Yiddish language . . . Now the traces of this life seemed like alien elements.” How can one still live here? she wonders. Perhaps the most stunning chapter is the one about Babi Yar, site of the horrific massacre of Kiev’s Jews during World War II. Being there, where several relatives perished, Petrowskaja asks, “Does a place stay the same place if, at this place, people murder, bury, blast, hollow out, burn, grind up, scatter, hold their tongues, plant, lie, create landfills and backfills, fill up with concrete, once again hold their tongues, block off, arrest mourners, and then later construct then monuments, commemorate their own victims once a year, or think they have nothing to do with it?” Her agony being there, and the sheer agony of the place itself, is our agony as we read details of what happened there. 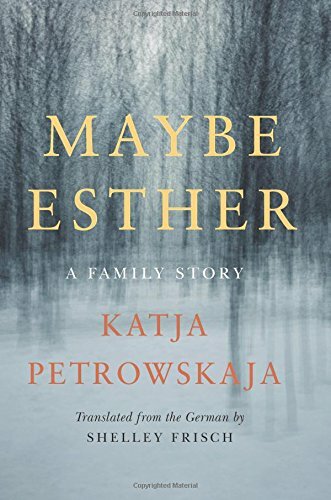 But there is more, for here is the place where “maybe Esther,” the author’s great grandmother is likely to have died, not on the forced march to Babi Yar because she was too infirm to walk there and so was likely shot to death on the street. The book is full with stories like these told against a historical backdrop that, like one’s family, must never be forgotten. But there is a challenge. How do you talk about what you can’t know, and how do you bring the past to life? Petrowskaja’s journey into her past is an attempt to answer those questions. Whether or not she succeeds, her family’s biography makes for interesting reading about a time, a place, and its people.